Depp has challenged himself by playing larger-than-life roles, including a supporting role in Oliver Stone's 1986 Vietnam War film Platoon and the title character in the 1990 romantic dark fantasy Edward Scissorhands. He later found box office success in the fantasy adventure film Sleepy Hollow (1999), the fantasy swashbuckler film Pirates of the Caribbean: The Curse of the Black Pearl (2003) and its sequels, the fantasy film Charlie and the Chocolate Factory (2005), the fantasy film Alice in Wonderland (2010), and the animated action comedy western Rango (2011) (in which he voiced the title character). Depp has worked on on nine films with director, producer and friend Tim Burton. 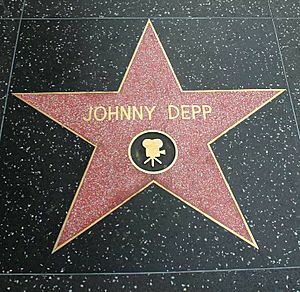 Depp is regarded as one of the world's biggest film stars. Films featuring Depp have grossed over $3.2 billion at the United States box office and over $8 billion worldwide. His most commercially successful films are the Pirates of the Caribbean series, which grossed $3 billion, Alice in Wonderland, which grossed $1 billion, Charlie and the Chocolate Factory, which grossed $474 million, and The Tourist, which grossed $278 million. 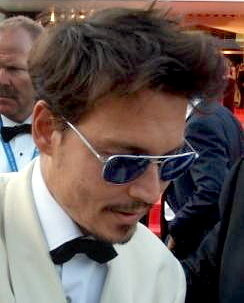 Depp has been nominated three times for the Academy Award for Best Actor. 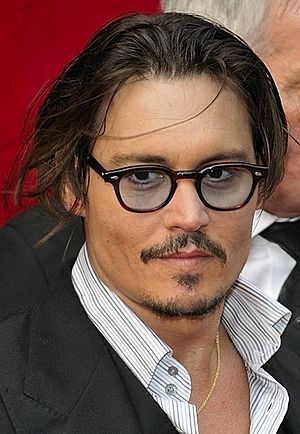 Depp won the Golden Globe Award for Best Actor – Motion Picture Musical or Comedy, as well as the Screen Actors Guild Award for Outstanding Performance by a Male Actor in a Leading Role. He has been listed in the 2012 Guinness World Records as the world's highest-paid actor, with earnings of $75 million. 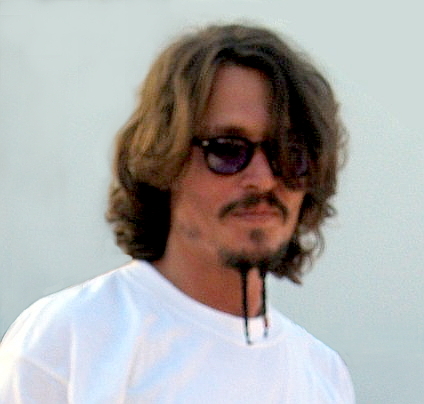 Depp was inducted as a Disney Legend in 2015. 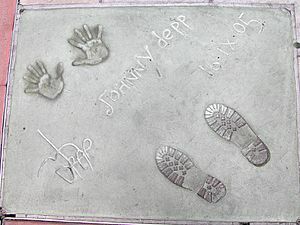 Depp was born in Owensboro, Kentucky, the youngest of four children. Depp is of mostly English ancestry, with some Dutch, Belgian, African and French ancestry. Depp moved frequently during his childhood. He and his siblings lived in more than 20 different places, eventually settling in Miramar, Florida in 1970. Depp's parents divorced in 1978 when he was 15. His mother re-married. With the gift of a guitar from his mother when he was 12, Depp began playing in various garage bands. A year after his parents' divorce, he dropped out of Miramar High School to become a rock musician. He attempted to go back to school two weeks later, but the principal told him to follow his dream of being a musician. He played in bands called The Flame, and later on The Kids. On December 20, 1983, Depp married Lori Anne Allison, the sister of his band's bass player and singer. During their marriage she worked as a makeup artist while he worked a variety of odd jobs, including a telemarketer for pens. His wife introduced him to actor Nicolas Cage, who advised him to pursue an acting career. Depp and Allison divorced in 1985. His first movie was Nightmare on Elm Street in 1984, which was a success. Afterwards, he decided to go to an acting school in Los Angeles. He got a small part in the movie Platoon and shortly after this, he was offered a part in the TV series 21 Jump Street which he first turned down but finally accepted. Since then he has been a star. He became a teen idol, which he didn't like. His ex-wife is Lori Anne Allison. He was engaged to Jennifer Grey and Sherilyn Fenn in the late 1980s. He had a four-year relationship with Kate Moss in the mid-1990s. He has a daughter, Lily-Rose Melody (born 1999) and a son John (Jack) Christopher III (born 2002) by his former partner, French singer Vanessa Paradis. He began a relationship with Amber Heard in 2012. The couple married in February 2015. She filed for divorce in May 2016. Depp was adopted as an honorary son by LaDonna Harris, a member of the Comanche Nation, on May 22, 2012, making him an honorary member of Harris's family but not a member of any tribe. Johnny Depp Facts for Kids. Kiddle Encyclopedia.